Last year I did a post about authors who blog (regularly). I’ve dredged up some more, which are rather enlightening (to varying degrees). John Green, author of Paper Towns, published last year (which we quite liked), writes in a chirpy, humorous, self-deprecating fashion, and even reads comments and comments on them. Megan McCafferty of Sloppy Firsts fame, has an interesting take on blogging. She’s called hers a (retro)blog, and she includes writing assignments and essays she produced in school (going back to the 1980s). You’ll also find articles she’s written on the Twilight saga, containing a hint that Marcus Flutie (from Sloppy Firsts, not Twilight) is based on a real person (or persons). Susan Beth Pfeffer, author of the horribly harrowing (really, really) stories about what happens to the earth when the moon is knocked out of orbit by an asteroid (The Dead and the Gone, and Life As We Knew It). Brent Hartinger updates his regularly (the key to keeping a good blog, that). Robin McKinley, author of Beauty and Sunshine (for those vampire fans). I love what she’s called her blog. Ysabeau S Wilce, author of two of the coolest-titled books ever. Her website is pretty flash, too. William Kostakis, who kindly responded to our questions last year. Incidentally, the wonderful Neil Gaiman is going to win the 2008 Weblog Best Literature Blog Award, unless people start voting for Samuel Pepys (actually, I find Samuel rather dull). If you’re a blogger and an aspiring author then this article might interest you. Lim May Zhee is a Malaysian teenager whose popular blog has been instrumental in her publishing two novels (her blog is here – warning: it’s rather pink). Not bad for a 17 year old. We were thinking if she can do it, then so can you! All you need is some talent, perserverance and a willingness to spend a large amount of time at your computer (remembering ergonomics and the importance of micropauses (and other things like NCEA we suppose)). If you’re a blogger leave a comment about your blog so we can check it out. 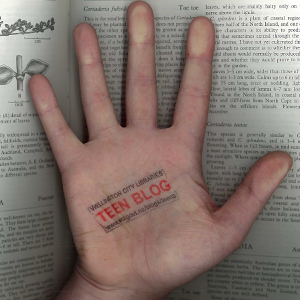 Don’t forget – we’re still looking for guest contributors for the Teen Blog. You can review books, CDs, films or games; or write about anything related to local teens and the library. Email us at teenblog@wcl.govt.nz if you’re interested. We’ve already been joined by Zach – the more the merrier. Do ye blog me hearties? 04.09.08 | Permalink | Comments Off on Do ye blog me hearties? It had to happen: novels in email form are so last year. Something to Blog About* by Shana Norris is about Libby Fawcett, who starts a secret blog to vent her frustrations after her life gets complicated and annoying and embarrassing. Libby’s blog entries are interspersed with her first-person narration throughout the book, so you get two perspectives from the same person. See what you think. And on the subject of blogging and writing… do you like writing? Are you interested in being a guest contributor on the teen blog? If you’re keen to have a go at writing about book, library, internet-related topics then email us at teenblog@wcl.govt.nz to begin discussions. * I’m guessing the title is inspired by the country song ‘Something to Talk About’ by Bonnie Raitt.